If you're looking to bond with your hamster and teach it some tricks, start training it. Training your hamster will increase its confidence and strengthen your relationship. Once your hamster is comfortable with you, you can teach it to jump, roll over, or climb. Train your hamster to use a litter box inside its cage and stop biting or chewing. With a little structure, you'll soon have your hamster eating out of your hand! While it's a good idea to begin training a new hamster early, let it get used to its new surroundings once you bring it home. 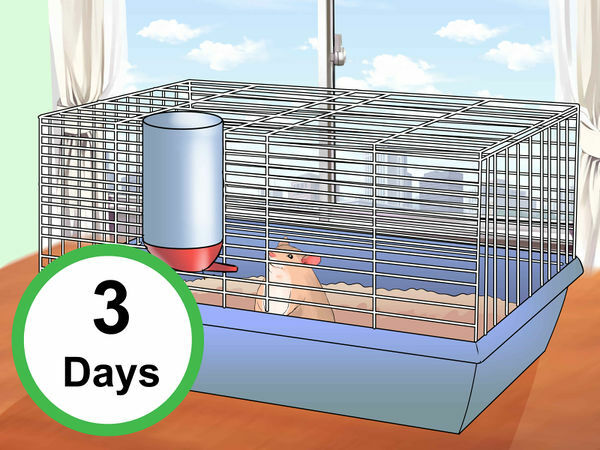 Gently put your hamster in its new cage and leave it alone for three days. Put fresh water and food in its cage, but don't try to hold or interact with it. Time alone will let your hamster become familiar with your smell, voice, and the sounds of the house. Your hamster should feel comfortable with you holding it before you begin training it. Talk to your hamster as you interact with it, so it becomes used to the sound of your voice. 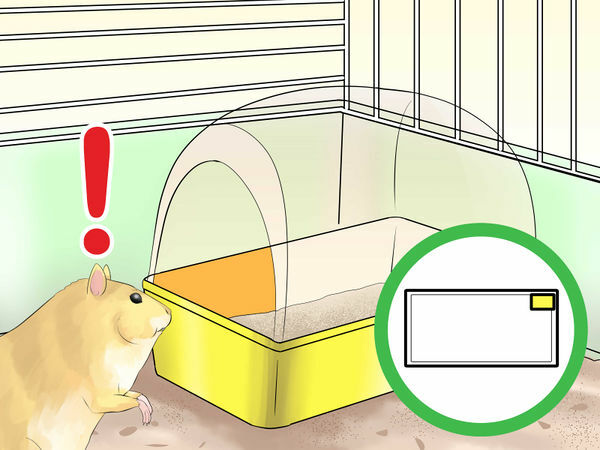 Pick your hamster up in one quick movement and avoid scaring or chasing your hamster before you pick it up. To pick your hamster up safely, first gently place your palm face-down on the cage floor. 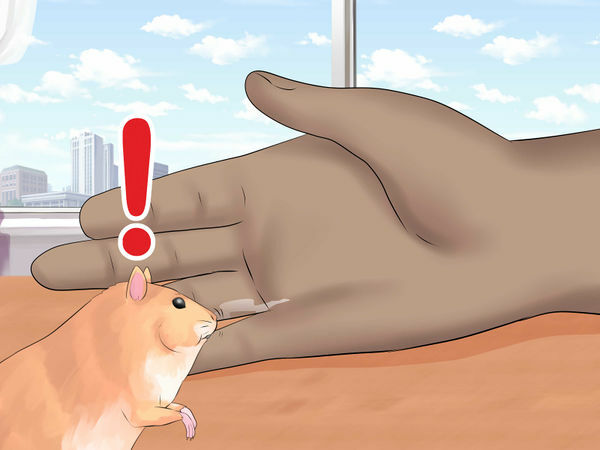 Slowly move it toward your hamster, turn your palm up, and let them crawl into your palm. Cup your hamster, and use your other hand to keep it from falling. Then, slowly and gently lift it out of the cage. 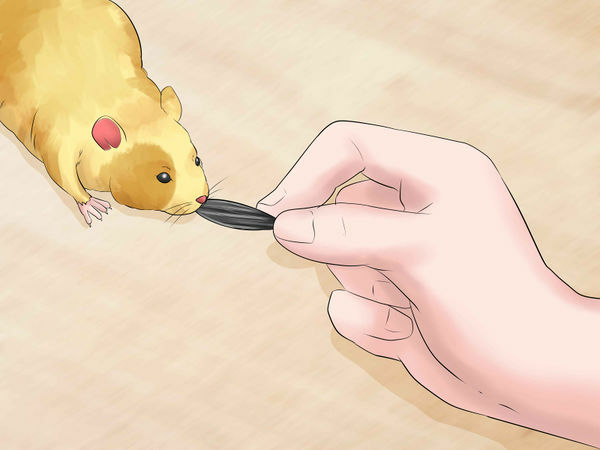 If your hamster is frightened of you, consider holding out a sunflower seed to get it interested in coming over to you. Pick up your hamster and let it eat the seed. Over time your hamster should become comfortable without the treats. Let your hamster crawl on you and your clothing so it can start to get used to your scent. Work on one trick or skill at a time with your hamster and limit your training sessions less than 15 minutes at a time. If it begins to lose interest in training, end the training session and let your hamster play for a while. 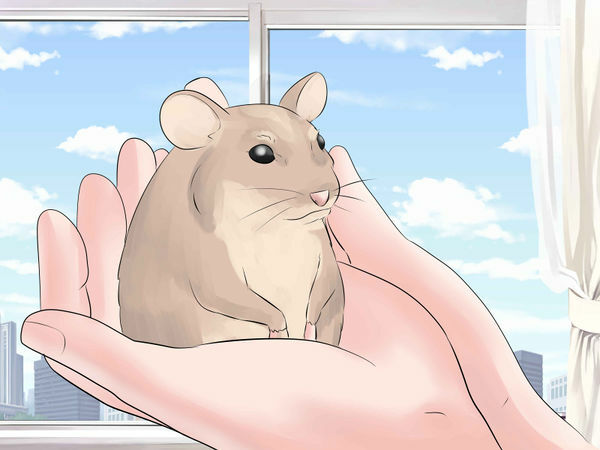 Pet your hamster and spend time with it throughout the day, so it can get used to you. Training is also a great way to bond with your new pet. Try not to wake up your hamster just to start a training session. Schedule them in the late afternoon and evening when your hamster will naturally be awake. 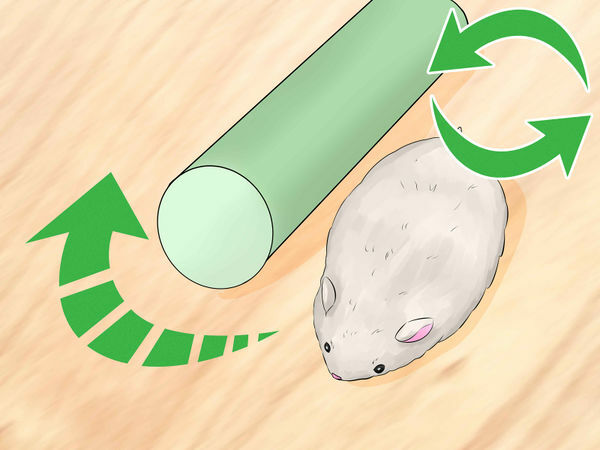 Start with basic skills and tricks that you'd like your hamster to do before moving on to more advanced skills. Follow your hamster's lead and don't push it too fast to learn a new skill. Be patient and remember that your hamster might learn some tricks faster than others. Make things interesting for your pet by teaching it a few different skills. For example, work on rolling over one day and standing the next. Alternate between the two tricks until your hamster follows the commands. Place a sunflower seed over your hamster's head and firmly say "Stand." If your hamster follows the command and stands up on its feet, give it the seed. If it doesn't, keep saying "Stand," until your hamster does it. Remember that your hamster will learn through repetition. Eventually, it should follow the command even if there isn't a sunflower seed above its head. Don't give your hamster the sunflower seed unless it stands up or you'll confuse it. You can also try this by saying "Paw" and putting the sunflower seed in front of your hamster. It should put its paw forward to get the treat. Carefully set a sunflower treat on your hamster's back and command your hamster to "Turn" or "Roll over." If your hamster rolls over, give it the sunflower seed. You can also give it verbal praise by saying something like "Good job!" If your hamster doesn't roll over, continue to set the seed on its back and give the command. Hold a sunflower seed in front of your hamster, so it can see it. 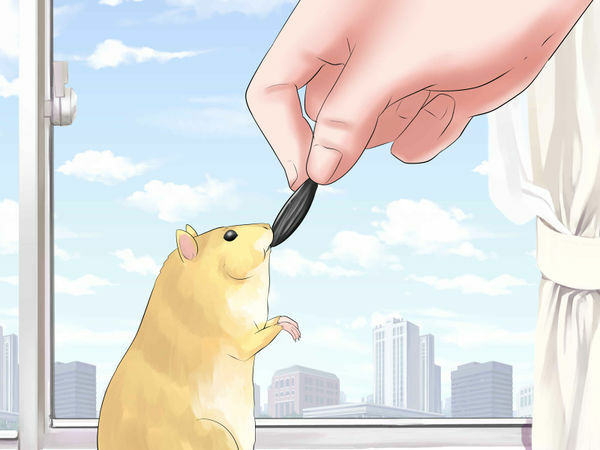 Raise the treat up above your hamster. The seed should be just out of reach and your hamster will probably stand to try to get it. Say "Jump" and your hamster should jump up a little to get the seed. Keep practicing this until your hamster associates jumping to get the seed with your command. 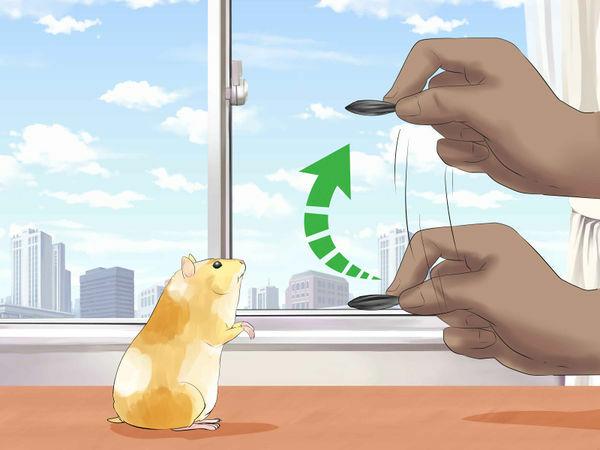 Don't place the seed too far away from your hamster because they can only jump a short distance. Set your hamster on your shoulder and see if it's comfortable sitting there. If your hamster seems happy to sit on your shoulder for a few moments, teach it to climb your shoulder. 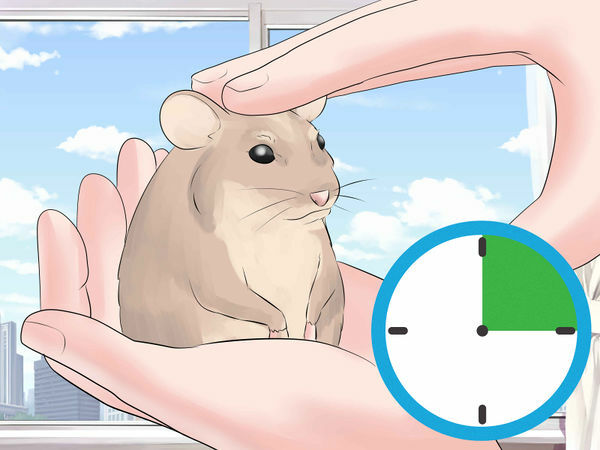 Place your arm down on a couch or bed and set your hamster next to your wrist. Use the other hand to put a treat on the opposite shoulder and say "Climb." Your hamster should walk up your arm towards your shoulder to get the treat. Ensure that your hamster sees you put the treat on your shoulder. 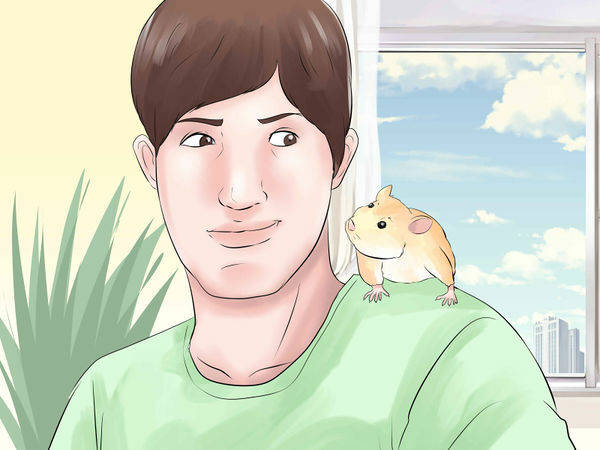 Only try this trick if your hamster is comfortable sitting on your shoulder. 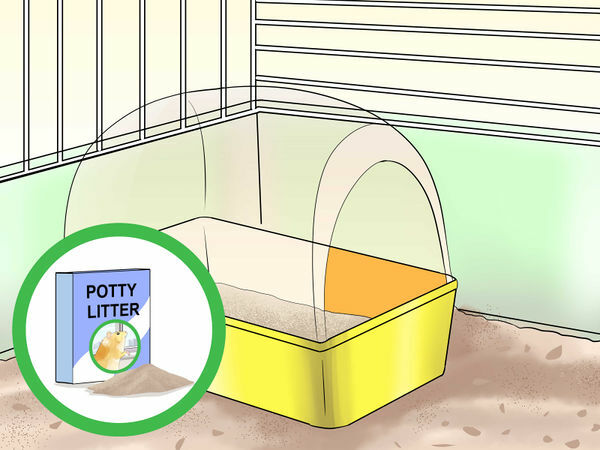 You can buy a small covered litter box that fits in the corner of a hamster cage or make your own. 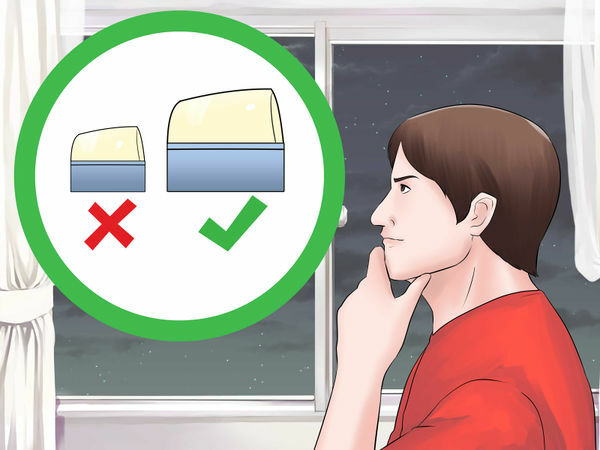 Take a small, sturdy container with a lid and cut a 2 to 3-inch (5 to 7-cm) hole in the side. Use sandpaper to rub down any sharp edges and put the lid on the container. Keep in mind that you'll need to replace homemade or commercial litter boxes if they're not chew-proof. Choose a litter that will absorb odors and be easy to clean. Look for wood, paper, grass, or grain pelleted paper. You can also use sand or cat litter, as long as it doesn't contain silica dust. Place a little litter in the bottom of your hamster's litter box. If your hamster tries to eat the litter, switch to a different litter that your hamster won't eat. Watch your hamster for a day or two to see which corner of the cage it's toileting in. 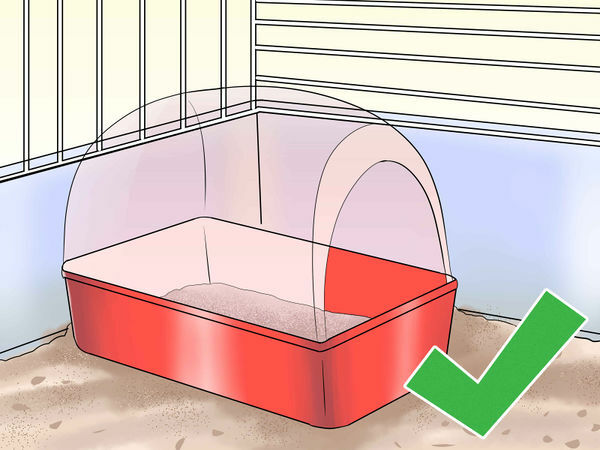 Put a little soiled bedding into the litter box along with a few hamster droppings and set the litter box in your hamster's preferred corner. Your hamster should start using the litter box without any problem. Give your hamster a chance to explore its cage right after you've put the litter box in. Don't force it to go straight to the litter box or it may not want to use it. If your hamster isn't using the litter box, determine why. If it's sleeping in the litter box, it probably needs a separate sleeping space. If your hamster is eating or hiding food in the litter box, the cage might be too small for it. If it's simply not using or going into the litter box, the litter box might be too hard for your hamster to get into or it might dislike the litter. Try a larger box or different litter. You might have to try a few solutions before you fix whatever problem is keeping your hamster from using the litter box. Hamsters might bite if you smell like food or another hamster. Wash your hands and set your hamster out on a bed or a couch. Let it roam around and block its path with the backs of your hands every once in a while. Your hamster should sniff you and then move on. Try to do this for 5 to 15 several days in a row. Eventually, your hamster will become comfortable with your scent and will realize that you're not trying to grab it with your hands. Never stroke or try to hold your hamster when it is eating, washing itself, or sleeping. Interrupting your hamster can cause it to bite. If your hamster does try to bite you, very gently blow towards its face to distract it from biting. Be patient with your hamster and give it space before you try to interact with it again. Avoid yelling at, hitting, or punishing your hamster. Hamsters don't understand punishment, so you'll only damage your relationship with your hamster and encourage it to be aggressive. If your hamster is usually angry and bites, let it play or do something it enjoys before you try to interact with it. Hamsters often chew or gnaw on things to grind down their teeth. 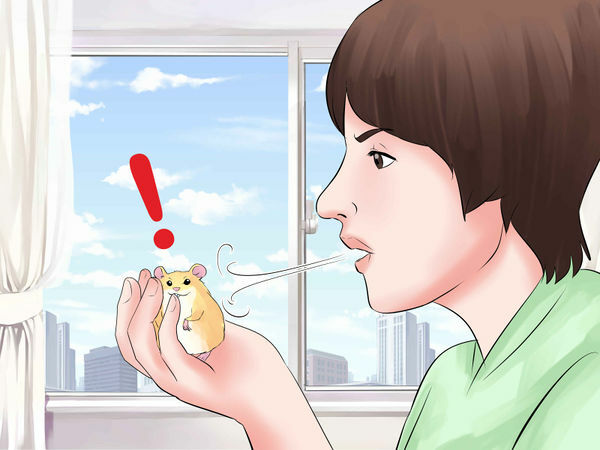 If your hamster is chewing something it's not supposed to, firmly say "No," or "Stop." 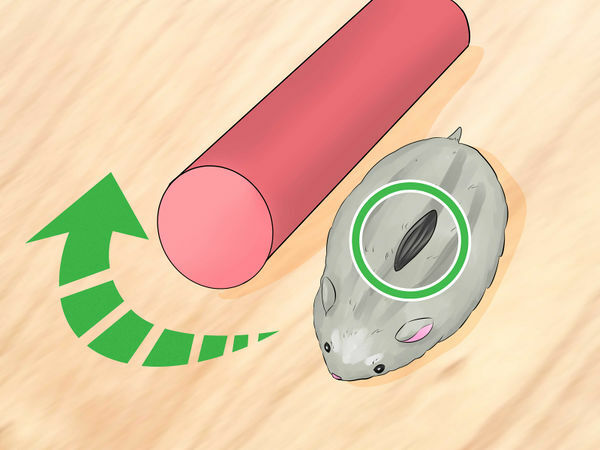 Move your hamster away from the object and set out other items that your hamster can chew. Offer different types of chewing objects, so it can choose one that it likes. 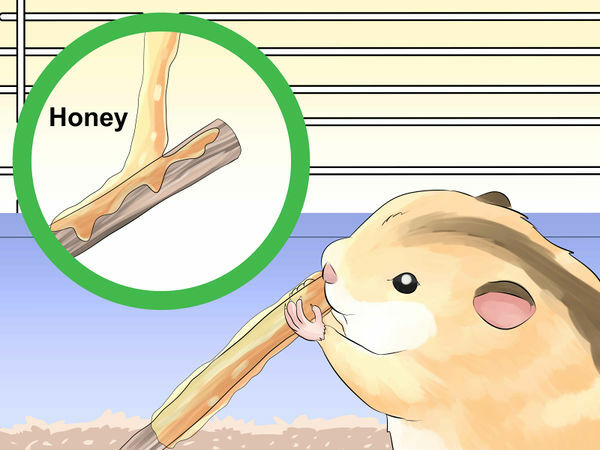 Set out new chew sticks, try coating them with honey, rub a carrot on the sticks, or shave off a bit of each stick to encourage your hamster to chew them.